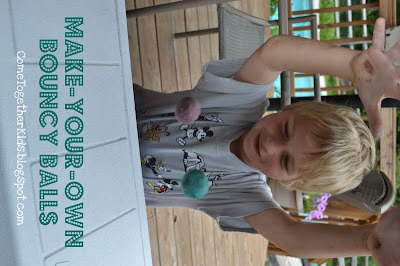 I recently shared this little project as part of the Summer Staycation series at Moms by Heart. 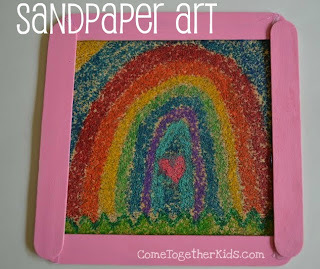 We loved it because you get the fun effect of sand or glitter art, without the mess! When I was a little girl, I remember doing an art craft where we colored on sandpaper then ironed it onto a piece of paper to get a copy made up of lots of tiny dots (similar to the pointillism art movement). I wanted to do the same project with my kids, but unfortunately, our ironed copies didn't turn out as well as I hoped. However, when we looked at the pieces of sandpaper with the melted wax, we LOVED it. It looked just like those sand art pictures you see, but without the mess! We ended up making several and loved them all. 1. Cut your sandpaper to the size you want your finished piece to be. We planned on making popsicle stick frames for our artwork, so our pieces were about 5.5" squares. 2. Using crayons, color your picture on the sandpaper. You'll want to press pretty hard to get a nice layer of color. You'll also want to have your picture cover the entire piece of sandpaper, so make sure you color the background too. Notice how the whole piece is covered and the crayon is on nice and thick. 4. Carefully lift up the paper to reveal your picture. You can see how ours did make a copy, but it just wasn't quite what we were hoping for and was a little blotchy in spots. 5. 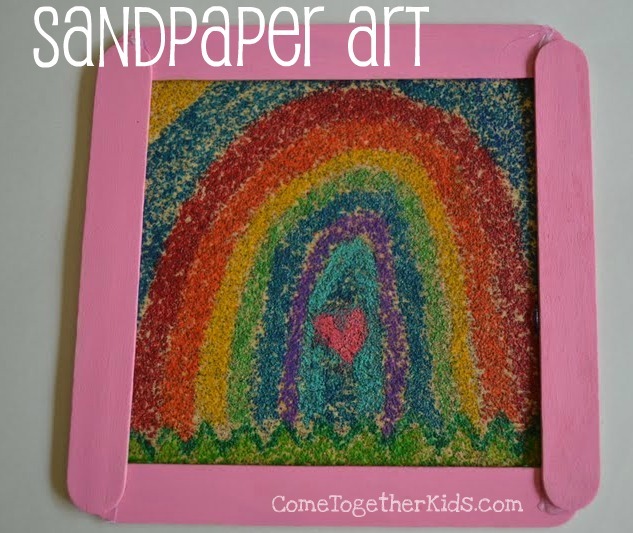 However, if you look at your sandpaper, you'll see that the crayon wax has melted onto the grains of sand in the sandpaper, making it look like you glued on lots of different colors of sand. The picture doesn't quite pick it up, but some of the crayons were sparkly, so it had the effect of glitter in the finished piece. 6. Of course, every piece of art looks better in a popsicle stick frame, so we painted some popsicle sticks to match our new masterpieces. 7. 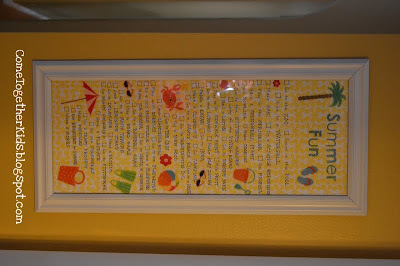 Glue your Sandpaper Art into your new frame ( I used hot glue because it worked better than the Elmers on the sandpaper) and your project is complete. Pretty cool and there's no messy sand or glitter all over your house! one of her international cookbook kits for kids. This opportunity was perfect for us. and my youngest loves to do anything her big sister and brother do! Plus, one of the things on our Summer Fun Checklist was to "Try a New Food." When I looked through the cookbook I was really impressed with both the variety of recipes and the fact that these were real recipes but presented in a kid-friendly way. There are five Handstand Kids' characters you meet who lead you through the recipes and give interesting little facts and suggestions throughout the cookbook. One other feature that we thought was really cool were the pages that listed all the utensils and ingredients you'd be using. Each item had a picture and both the English and Chinese word for each item. The kids got a huge kick out of looking up and saying the Chinese term for each tool or food we picked up to use. For our dinner, we tried the "Great Wall of Chicken Lettuce Wraps". Everyone loved them and my husband even said they were as good as similar ones he's had at P.F. Changs. My oldest (and chef-to-be) got to use a real knife to cut the scallions. My son chopped the water chestnuts. Seriously, they were snacking on them right out of the can. They liked how the ginger root "looked like a tree branch"
and smelled "kind of like a spicy lime"
After all the ingredients were chopped, grated, mixed and cooked, our dinner was ready! But fingers and forks got more food to their mouths! Then for dessert, we made some "Banana-rama Spring Rolls". Fun to make and totally yummy! Fun using a pastry brush. Without a doubt, we'll be making more recipes out of our cookbook soon. The kids had a blast learning and cooking and we all really enjoyed the food. Now, if all that talk about cooking and eating has you hungry and wanting to try some recipes with your own family, you're in luck! You can now purchase these awesome cookbook kits at these Bed, Bath and Beyond locations. 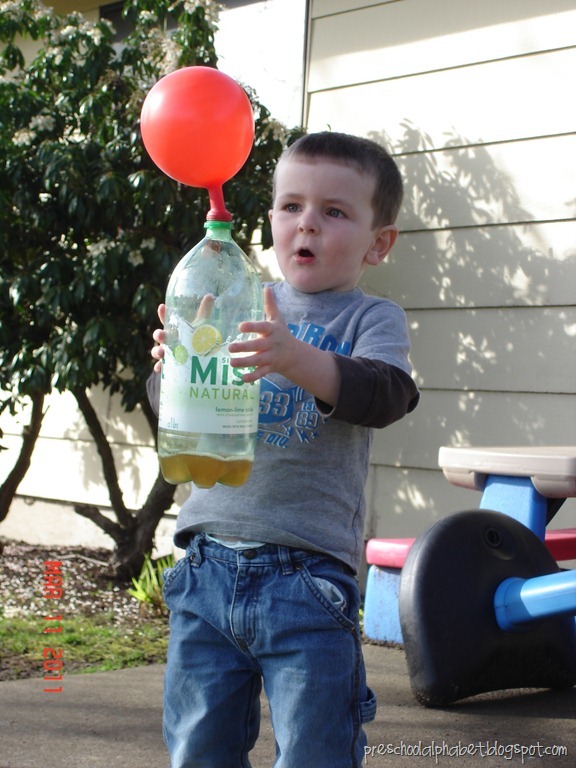 Handstand Kids will also be giving away one of their International Cooking Kits to one of my lucky readers!! Please leave a separate comment below for each entry and include your email address if it's not on your blogger profile so we can contact the winner. The Giveaway will end next Friday, July 1st. that you might not be able to squeeze in during the school year. that you foster in your children lasts forever. 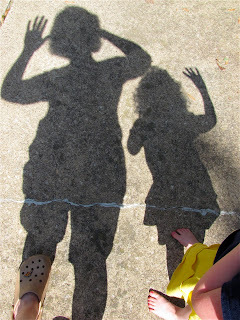 to our Summer Fun Party! Okay, this is seriously so cool! 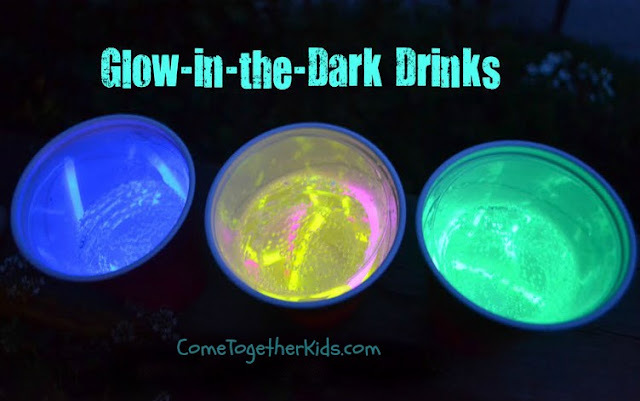 ( they got to drink soda AND it glowed!!) and it was so simple. To celebrate the first night of Summer Vacation, the kids got to go out in the backyard in their pj's to catch lightning bugs. While they were filling their jar with fireflies, I remembered THIS cool idea for glow cones I'd seen on Pinterest. I ran inside to see if I had everything I needed. Luckily, I found a package of glow sticks leftover from Halloween. I didn't have any shaved ice, so I just used Sprite, but it was still super cool. This is all you need: some glowsticks, clear plastic tumbler cups, larger opaque cups ( I used the red keg cups) and your beverage. I definitely plan on doing this again throughout the summer. How cool would it be to have when you're waiting for fireworks on the Fourth of July? ( my youngest finished up on Tuesday). to hang on our front steps. Notice the cute sign but ignore my overgrown bushes. I'll get to them someday! they were so excited to see the sign. and tearing it to bits! but got such a great reaction from the kids! Thanks to Family Fun for the inspiration for this idea. Bouncy Balls that the kids made themselves!! If you have not had a chance to stop by Making Memories with Your Kids to see all the AMAZING projects Erin does, you have to check it out! 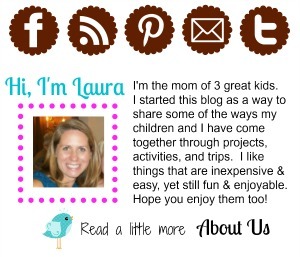 She shares the coolest ideas of things to do with your kids and lots of amazing recipes too. 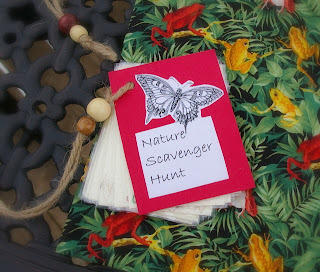 When Erin linked up this post to my Summer Fun party, it went straight to the top of my "Must Do" list for this Summer. The best part is they were SO easy to make. 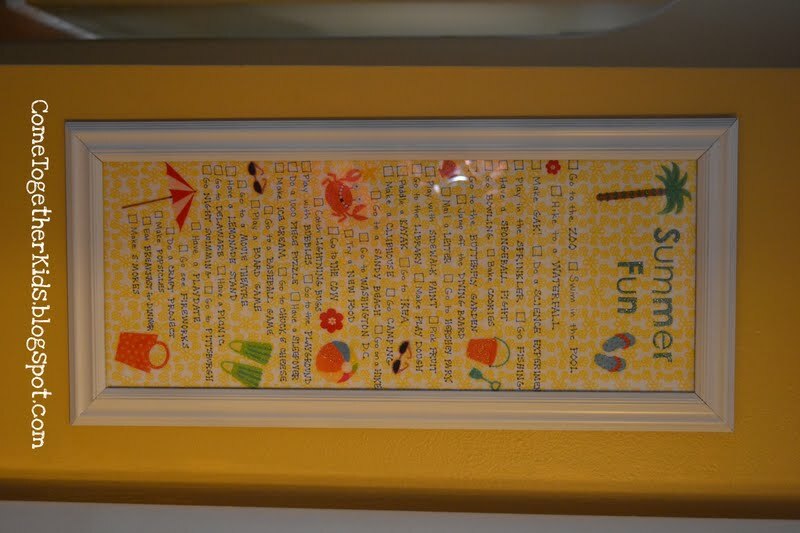 A couple weeks ago, I posted these Five Fun Ideas for Summer Planning from our Summer Fun party. 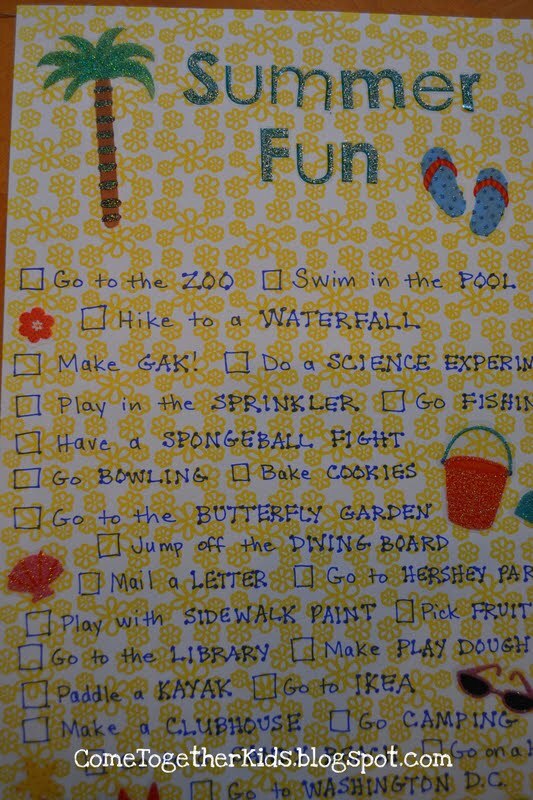 I finally had a few minutes this week to sit down and make up my own Summer Fun checklist for our family. (and just in time, the kids' last day of school is tomorrow!) 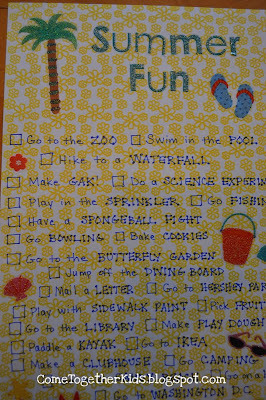 I just wrote our list on some patterned scrapbook paper and decorated with a few summer-themed stickers. Inspired by this great idea at eighteen25, I framed my checklist (by spray painting a frame I scored at Goodwill for $3!) We'll use a dry erase marker to check off the activities as we complete them. 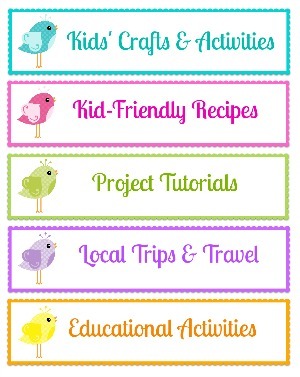 The kids LOVE it and are so excited to start their summer vacation and jump into all these activities. Many of them we'll do more than once, so we decided we can erase the initial checkmark and write the number of times we've done that activity. I'm also sure we'll do lots of things not on the list, but since I knew the kids would hold me accountable for every item listed, I wanted to keep the checklist a manageable size and include only the things I was confident we'd be able to do. Hanging up on the wall, ready to go!